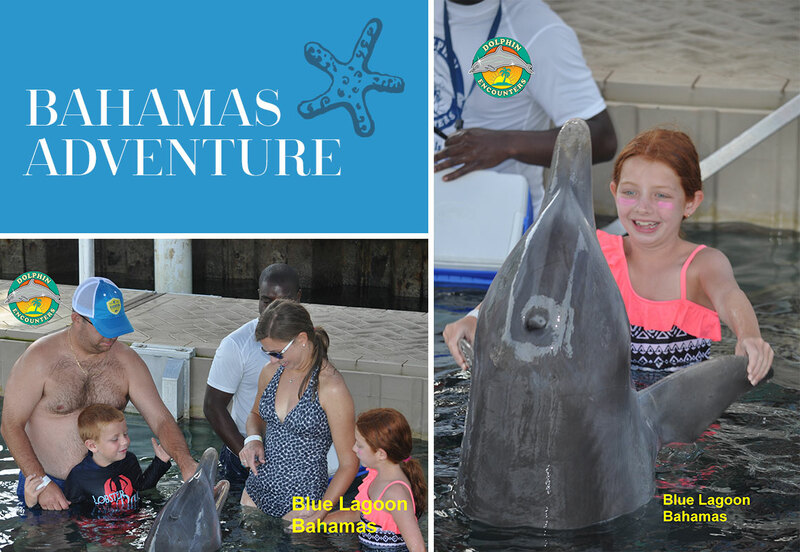 When we planned our trip to the Bahamas to stay at Atlantis Resort, I knew I wanted to plan a family encounter with the dolphins. When I was doing my research, I found a few choices. First was the onsite facility at Atlantis. However, I was also intrigued by another location just off of Paradise Island, Dolphin Encounters. Dolphin Encounters is located on their own island called Blue Lagoon Island. I contacted them to see how we would get there from Atlantis (since we didn’t have a car and we were traveling with another family and 5 kids in total and needed this to be easy), they informed me that the ferry dock was right outside of Atlantis near the Royal Towers. Perfect! We booked the 8:30 AM ferry to Blue Lagoon Island and the Shallow Water Dolphin Interaction. My husband and I had our two kids and our friends joined us with their 3 children. We had 5 kids under the age of 10 and all of the kids could participate, even the 2 year old! From the moment we got on the ferry the employees came around and spoke to all of the people. They were so polite and friendly, they even offered to take pictures of our group. Their friendliness was contagious and by the time we pulled up to the Blue Lagoon Island everyone on the ferry was smiling! Once we arrived on Blue Lagoon Island after our very pleasant and quick 15 minute boat ride, we did our Dolphin Encounter first. It was just great. After a quick introduction to the facility and how they care for the dolphins, we jumped right into the water with the dolphins. The trainer was very animated and we loved being in the water with the dolphin giving him a hug, dancing with him and feeding him. We learned all about the beautiful mammal and each of the kids had huge smiles on their faces the entire time. I loved that the people from Dolphin Encounters were taking a video and many pictures of our experience. I love to capture these moments and knew those would be great keepsakes! Of course, we purchased some pictures and the video – I am a sucker for that and loved that they captured our moments so perfectly! Our plan after our encounter with the dolphins was to take the ferry back to Atlantis. But we quickly learned that there was so much more to explore on Blue Lagoon Island. First we walked around the entire dolphin area and also saw the sea lions. Then we ventured to the beach area of the island. One of the most memorable women from the ferry was there, Katherine, and what a sweetheart she was! She really gave us a true Bahamian experience. You can really feel the family-run atmosphere here on Blue Lagoon Island (family run since 1989). They say their employees are family, and they made us feel like family too! After a fabulous day enjoying Blue Lagoon Island with the kids, we sailed the ferry back to our hotel. It was absolutely the best day of our vacation! The kids were tired. But they enjoyed dancing and singing on the ferry boat home with the wonderful employees! What a great end to a great day. They have a saying in the Bahamas, “if you get sand in your shoes, you will be back.” We got Blue Lagoon sand in our shoes and it was a memorable day we will not forget! If you are at Atlantis or another resort in the Bahamas, or on a cruise, Blue Lagoon Island and Dolphin Encounters is #nottobemissed! TIP: Even if you don’t reserve an animal encounter, you can buy a beach pass for the day. Many cruise ship passengers do this as an excursion and I highly recommend it! The kids had a blast on the wonderful beach and playing on the inflatable obstacle course in the water. What a relief from the crowds at Atlantis! We felt like we were in our own private oasis. TIP: Plan to stay for lunch! If you’ve read my other reviews, you know that we love to eat on our vacations. We live in South Florida and have been to different parts of the Bahamas before where we have enjoyed the local cuisine. I have to say the conch we had on Blue Lagoon Island was the best we have ever had! We enjoyed conch fritters and cracked conch sandwiches. YUM! We were guests of Dolphin Encounters for purposes of this review. I give my honest opinion in my reviews no matter who is picking up the tab.